One of top 2015 Guards on the West Coast Jordan Roberson of Rancho Cordova out of Northern California. Jordan has been showing out grabbing major attention from college recruiters and media outlets. 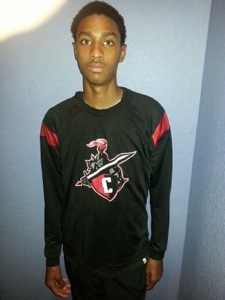 Mid Major Hoops Report has brought him to our “Players Corner” where we at MMHR are proud to highlight him as one of the fastest rising prospects in the 2015 Class…. Jordan Roberson: I am 6”4 160lbs and I can play the point guard and/or shooting guard position. Jordan Roberson: The season is going pretty good we are 8 wins 4 losses. We are leading our section in points per game and in steals. Overall, its living up to a few of the expectations, it could be better. I feel we should be 10 and 2. Just made mistakes that we shouldn’t have. Jordan Roberson: Our toughest matchup this year was against Encina Prep at our Christmas tournament when we lost by one point at the buzzer and it was neck to neck the whole way. Jordan Roberson: The colleges that have came to my games are Cal, Utep, UOP, Fullerton, Sac State. Colleges that came to my practice are Northern Arizona, Utah, Portland, Pacific, Uc Irvine, Sac State, San José, and Santa Barbra so far. Jordan Roberson: The colleges that are recruiting me the hardest is Northern Arizona, Fullerton, Portland, Utep and San Jose. I currently have two offers at the moment from UTEP and Northern Arizona. Jordan Roberson: I’m looking to see how hard they push education within their program and to see how they develop and produce their players and what their coaching background is like. Jordan Roberson: The college visits that I have planned is UTEP, Portland, Fullerton and Northern Arizona. I have completed visits to Cal, and UOP so far. Jordan Roberson: The camps that I plan on going to is the WestCoastSuperShowcase.com, John Lucas 40/40 camp, the Pangos All American camp and also the Reebok Breakout. Jordan Roberson: My strong points in my game is that I have a high IQ and I understand the game because ive been playing for so long. I have great emphasis on defense and offensively, I can score on the perimeter and off the dribble. I continue to work on my pull up jumper, Rebounding and I want to be an Elite shooter. Jordan Roberson: I am working on my game 3 to 5 days a week for up to 2 hours each day. Jordan Roberson: no I don’t have a twitter. Jordan Roberson: My parents have the biggest impact on me because without them I wouldn’t be here on earth and I wouldn’t be able to do anything im doing right now if it wasn’t for them . I know that they want the best for me and want me to do the best and be the best I can be. Basketball is a privilege that you have to earn so I have to get it done in the classroom or I cant play at all. Last my AAU coach Lester Diaz always pushing me to the limit to be the best I can on and off the court. Coach is talking to colleges for me, helping me get scholarship opportunities. Thank you, for your time Jordan and good luck on the rest of your season. Please keep in contact with MMHR to keep track of your recruiting. Im very proud of my Nephew J Rob!! !